Dictyoptera (from Ancient Greek diktuon "net" + pteron "wing") is an insect superorder that includes two orders of polyneopterous insects: the termites and cockroaches (both order Blattodea) along with the mantids (order Mantodea). While all modern Dictyoptera have short ovipositors, the oldest fossils of Dictyoptera have long ovipositors, much like members of the Orthoptera. The use of the term Dictyoptera has changed over the years, and while largely out of use for much of the last century, it is becoming more widely used. It has usually been considered a superorder, with Isoptera, Blattodea and Mantodea being its three orders. In some classifications, however, Dictyoptera is shifted to order status and in others the class Isoptera has been subsumed under Blattodea while retaining Dictyoptera as a superorder. Regardless, in all classifications the constituent groups are the same, just treated at different rank. 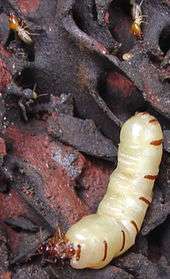 Termites and cockroaches are very closely related, with ecological and molecular data pointing to a relationship with the cockroach genus Cryptocercus. 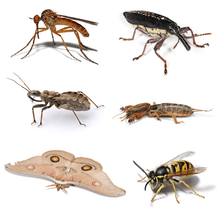 Based on genetic evidence, the closest living relatives of the Dictyoptera are the phasmids and the enigmatic groups Mantophasmatodea and Grylloblattodea. If the Dictyoptera are considered a superorder these three orders might be included in it. Evolutionary relationships based on Eggleton, Beccaloni & Inward (2007), are shown in the cladogram: The cockroach families Lamproblattidae and Tryonicidae are not shown but are placed within the superfamily Blattoidea. The cockroach families Corydiidae and Ectobiidae were previously known as the Polyphagidae and Blattellidae. Deimatic behaviour of the mantis Oxyopsis sp. ↑ Beccaloni, G. W. 2014. 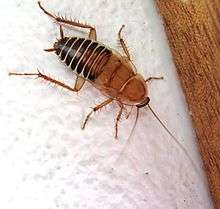 Cockroach Species File Online. Version 5.0 World Wide Web electronic publication. ↑ Legendre, Frederic; et al. (2015). "Phylogeny of Dictyoptera: Dating the Origin of Cockroaches, Praying Mantises and Termites with Molecular Data and Controlled Fossil Evidence". PLOS ONE. ↑ Beccaloni, G. W. & Eggleton, P. 2011. Order Blattodea Brunner von Wattenwyl, 1882. In: Zhang, Z.-Q. (Ed.). Animal biodiversity: An outline of higher-level classification and survey of taxonomic richness. Zootaxa, 3148: 199–200. Inward, D., G. Beccaloni, and P. Eggleton. 2007. Death of an order: a comprehensive molecular phylogenetic study confirms that termites are eusocial cockroaches. Biology Letters 3:331-335.